I’m not very familiar with the Yu Yureka brand, but I have a feeling it’s an actual phone brand. Anyway we’ve got the phone design here, sent to us by Nilesh Chaudhari. The smartphone has a golden case, at least on the sides. Its design feels a bit like one of the Galaxy S6 Edge, but with a tad more metal in the mix. 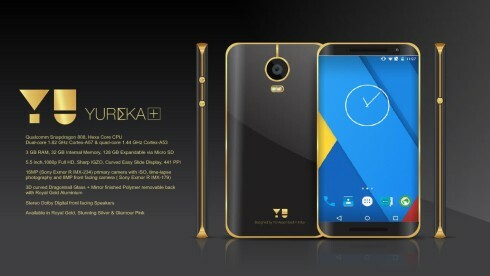 The Yu Yureka+ is the name of the newcomer, that packs a Snapdragon 808 hexa core CPU, as well as 3 GB of RAM and 32 GB of storage. There’s also a 5.5 inch Sharp IGZO display, with curved edges and the back side integrates a 16 megapixel camera with Sony Exmor R sensor. In case you’re wondering, the back side is all mirror finished polymer removable with royal gold aluminum. Yu Yureka+ has stereo stereo Dolby digital front facing speakers and it comes in royal gold, stunning silver and glamour pink. The core idea? Imagine a Galaxy S6 Edge with some gold (real or just the color), buttons with more personality and more powerful speakers.